I first came across Boden when I had Ben in 2008; I was searching for kids clothes that weren’t plastered in slogans or animals or cartoon characters, and they ticked every box. While we don’t have the budget to buy everything from there, they’re now my go-to place for those extra Christmas and birthday presents (admittedly not much of a present for the kiddos, but the only way I can justify spending more than we usually would!) – the quality is always top-notch, they wash marvelously and seem to last forever. They also do great gender-neutral jumpers and t-shirts, which are great because I can buy for Ben and then keep them for Daisy. Result! These days, I get equally excited about the womenswear as well; the new season pieces are amazing, and include quite a few things that I’ve had on my wish-list for ages; I’ve been searching for the perfect metallic and leopard print boots for almost my entire twenties, and now Boden have produced both in the same season *squeal*. 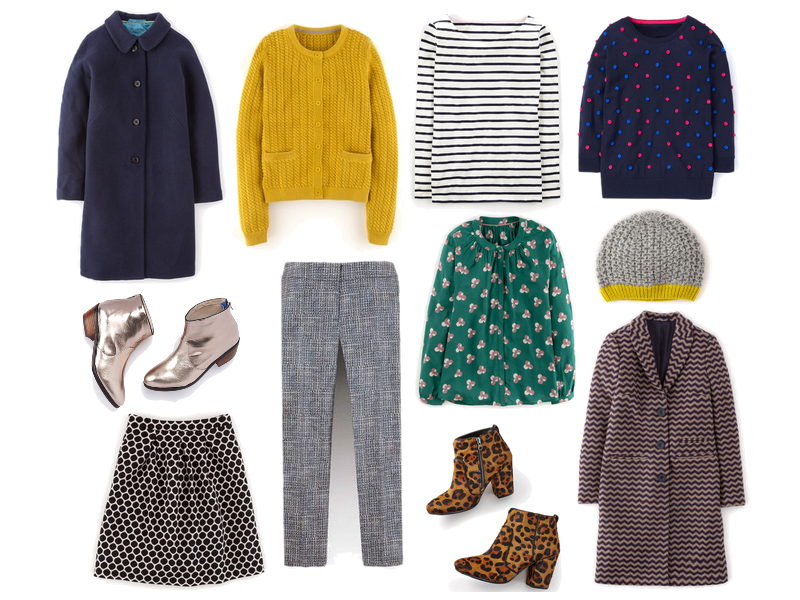 The yellow cardigan is pretty much the ideal shade (mustard-y but not too close to tan), there is a jumper with pom poms, and let’s face it – who doesn’t want a chevron coat?! They’ve also launched a blog recently, which is a great read, and includes Olivia Purvis and Sasha Wilkins as contributors (two very stylish ladies who write great fashion blogs). My favourite feature so far was the piece on five different bloggers and their personal style; as well as discovering the fabulous Stylonylon blog, they also included the lovely Kat from Kat Got the Cream and her smashing daughter Flo. If you’ve never read the blog – check it out! PS I’ve had a quiet few days working on some exciting magazine pieces, and also some not-so-exciting copywriting assignments, but I’ve got some great posts lined up for this week; another fantastic Bloggers Homes feature, a DIY project and a peek inside our own house (only two years after we moved in!). I think this autumn/winter collection is my favourite EVER from Boden, such a great array of patterns and shapes, that chevron coat would never fail to raise a smile!! 🙂 I need to head to my local store for a try on session immediately! I pretty much want two of everything! I love Boden. Boden and Fever are the two modern brands I wear very much of. That said, I always wait for the things I like to come into clearance as I can't afford stuff from Boden at full price!